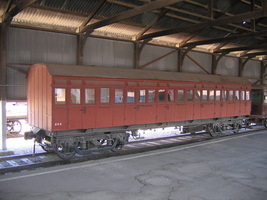 Side Loading 47 foot 1 inch Lavatory Carriage with accomodation for 54 second class passengers. 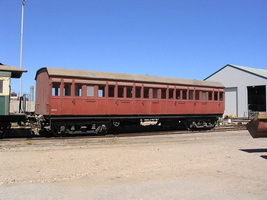 Second class side loading 47 foot 1 inch lavatory carriage with accomodation for 54 passengers built at the Islington Workshops. 23.12.1910 Issued to service as second class car No.288 seating 54 passengers. 1961 Sold to the Commonwealth Railways in and converted to camp train sleeper "EC 138". 23.12.1910 Issued to service as second class car No.289 seating 54 passengers. 1961 Sold to the Commonwealth Railways in and converted to camp train sleeper "EC 142". 21.12.1910 Issued to service as second class car No.290 seating 54 passengers. 21.12.1910 Issued to service as second class car No.291 seating 54 passengers. 1961 Sold to the Commonwealth Railways in and converted to camp train sleeper "EC 143". 23.12.1910 Issued to service as second class car No.292 seating 54 passengers. 1961 Sold to the Commonwealth Railways in and converted to camp train sleeper "EC 154". 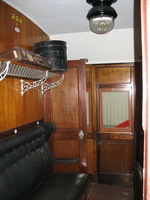 16.12.1920 Altered to composite seating 14 first and 36 second class passengers. 1.7.1929 Returned to all second class. 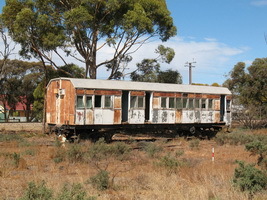 - Partially rebuilt for use on the Tailem Bend accident Train. 7.11.1966 To the Mile End Railway Museum. 22.12.1988 To Port Dock Station Railway Museum. 23.12.1910 Issued to service as second class car No.291 seating 54 passengers. 1961 Sold to the Commonwealth Railways in and converted to camp train sleeper "EC 153". 23.12.1910 Issued to service as second class car No.296 seating 54 passengers. 23.12.1910 Issued to service as second class car No.297 seating 54 passengers.